YoYoFactory - Maximum Stability, Maximum Spin, and Maximum Performance!! The Genesis has always been a crowd favorite in the YoYoFactory lineup. 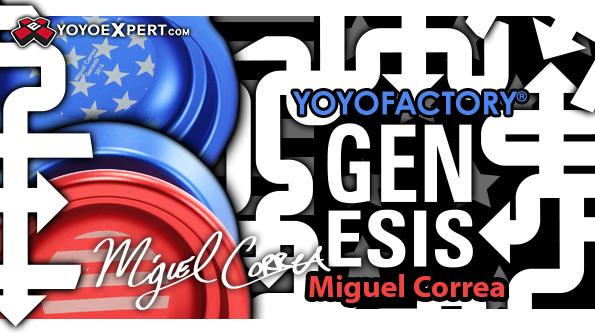 It's a powerful competition level yo-yo and the signature model of 5A National Champion and Team YoYoFactory member Miguel Correa! This is the latest and greatest YoyoFactory Genesis! YoYoFactory is continuously redesigning and tweaking their favorite yo-yos to bring them up to the standards of modern competitive play, and this latest version of the Genesis is serious competitor! The signature Genesis H-shape already screams stability and spin time, but with the more angled profile and redistributed weight you're going to feel a whole new monster. This yo-yo is as fast and maneuverable as it is stable! Maximum stability, maximum spin, and maximum performance - That's what the Genesis brings to the table. The Genesis was made to perform and that's what it does! Pick up the new 2015 Miguel Correa Signature Genesis and take your 1A, 3A and 5A play to the next level! It's time for less throws and more tricks with the new Genesis!